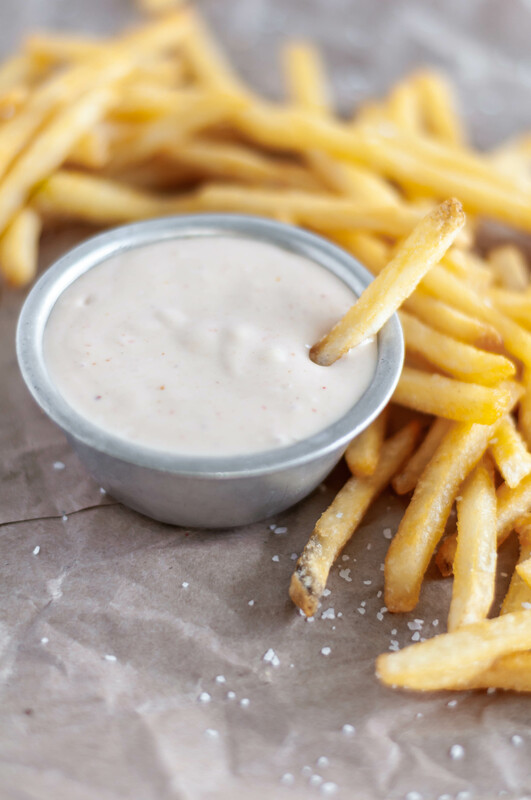 Spicy Fry Sauce is perfect for dipping those crispy french fries and onion rings. This spin on classic fry sauce has a few spicy additions. Let’s talk fry sauce. That glorious mixture of mayo and ketchup with a liiiitle splash of pickle juice is just the best for dipping fries. It’s forever and always my favorite dip for french fries. That being said, sometimes it’s fun to spice things up. See what I did there? So, I took my favorite classic fry sauce and mixed in a few spicy ingredients to change it up. First, the pickle juice is replaced with the juice from a jar of pickled jalapenos. It adds a little kick of spice while still providing that tangy, vinegary background that makes fry sauce so delicious. That wasn’t quite enough to consider it spicy so I added some cayenne add another kick. This spicy fry sauce is obviously perfect for crispy fries but it’s also a great dip for onion rings, potato wedges, tater tots, basically anything starchy and crispy will be a huge success with this dip. It tastes even better if you mix it up a hour or so before you are going to eat it to give it time for the flavors to mingle. You literally only need a minute to mix this up so you can have it on the fly whenever the craving strikes. Spicy Fry Sauce is the perfect little sauce for your french fries. Super simple to make with a few refrigerator staples. Mix together all the ingredients in a small bowl. Keep refrigerated in an air tight container.